Pamela Gockley is an entrepreneur, author, speaker, trainer and coach. Her credentials include over 15 years of experience in Internet and business management, sales, consulting, training, and coaching. She is a specialist in keynote speaking and training in Internet marketing and online social media areas. Using what she has learned over those years, Pam has written books and articles on the subjects of Reputation Marketing, personal enrichment and career development. 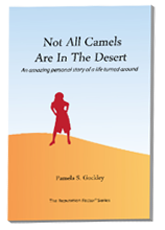 Checkout Pam's new book, Not All Camels Are In The Desert available now! Published in 2012, Pam's first book The Reputation Factor debunks the myth that reputation is a side effect of marketing, that it gets set in stone, or that it just “happens” over time, all by itself, as a result of outside forces. With the myriad of communication and marketing tools we have at our disposal, it’s tempting to spend inordinate amounts of time relying on image and outreach to establish attractiveness, until finally, when sales fall or stay flat, or job interviews yield a discouraging pattern of rejection after rejection, we are back where we started, standing still, or worse—unable to deliver on promises.